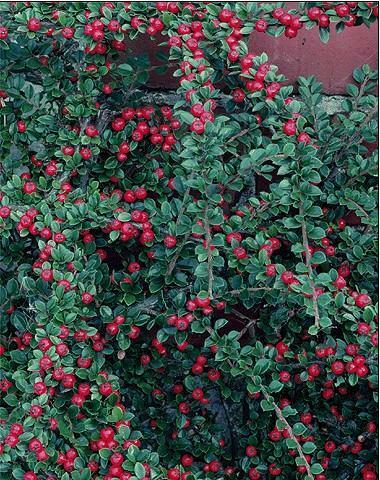 Home|Floral Library|Cotoneaster – Cotoneaster spp. Decorative Life: From 3-12 weeks for the foliage, depending on species. For example, C. congestus lasts about 3 weeks while C. microphyllus cochleatus can last up to 12 weeks. As a member of the Rosaceae (rose) family, common relatives include apple, peach, plum, geum, spiraea, pear, potentilla, quince, rose and strawberry. Leaves are of various shapes and sizes on woody stems. Stems are cut to various lengths. Classed as a dicotyledon, leaves not parallel veined. Species are woody evergreen or deciduous groundcovers or shrubs. From the Latin “cotoneum” (quince) and “aster” (resembling) referring to the similarity of the leaves of the two genera. Many species with attractive flowers and fruits. Very common landscape plant yielding mostly red fruit.